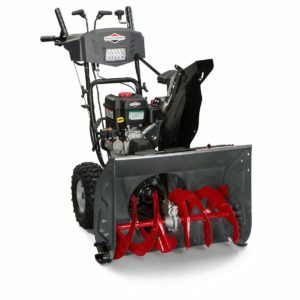 The Briggs & Stratton Dual-Stage Snow Thrower with 250cc Engine and Electric Start convenience is a great machine for the average homeowner. slightly smaller at 27 inches wide it is easier to store in a garage or out building. It comes with friction disc drive and multiple speeds forward and reverse, remote chute control for one handed control and a powered LED light for safe operation at night. this snow thrower is only available within the US at the time of writing. There were 204 customer reviews with 76% of those rated four or better at the time of writing. Most people loved the machine from the time they received it, while some people had issues with the warranty and customer service. this Briggs & Stratton snow thrower is made in China. One buyer received a defective machine and had a lot of difficulty getting it dealt with. There were 204 reviews, with 76% indicating a rating of 4 or better. The vast majority of people were very satisfied with this machine. There were some minor complaints about warranty and customer service issues. They did not indicate if this was an Amazon issue or a supplier issue. For more reviews of various sized snow throwers, including Briggs & Stratton snow throwers, check out the various categories for size and type.